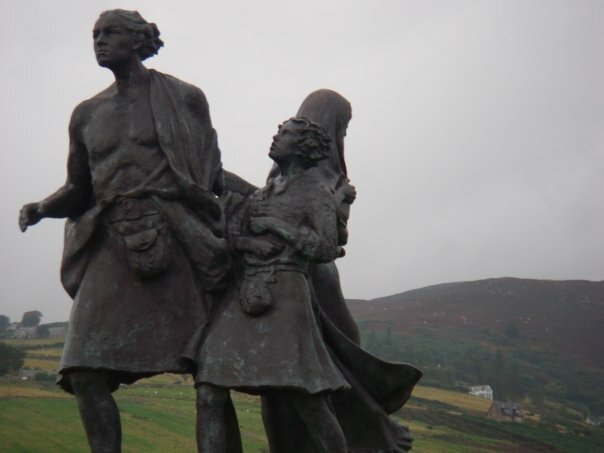 The Highland Clearances (Scottish Gaelic: Fuadaich nan Gàidheal, the expulsion of the Gael) were forced displacements of the population of the Scottish Highlands in the 18th century. It led to mass emigration to the coast, the Scottish Lowlands, and abroad. It was part of a process of agricultural change throughout the United Kingdom, but was particularly notorious due to the late timing, the lack of legal protection for year-by-year tenants under Scots law, the abruptness of the change from the clan system and the brutality of many of the evictions. From the late 16th century the law required clan leaders to regularly appear in Edinburgh to provide bonds for the conduct of anyone on their territory. This brought a tendency among chiefs to see themselves as landlords. The lesser clan-gentry increasingly took up droving, taking cattle along the old unpaved drove roads to sell in the Lowlands. This brought them wealth and land ownership within the clan, though the Highlands continued to have problems of overpopulation and poverty. The various Jacobite Risings brought repeated British government efforts to curb the clans culminating after the 1746 Battle of Culloden with brutal repression, and the Act of Proscription of 1746 incorporating the Dress Act required all swords to be surrendered to the government and prohibited wearing of tartans or kilts. The Tenures Abolition Act ended the feudal bond of military service and the Heritable Jurisdictions Act removed the virtually sovereign power the chiefs had over their clan. The extent of enforcement of the prohibitions was variable and sometimes related to a clan's support of the government during the rebellion, but overall it led to the destruction of the traditional clan system and of the supportive social structures of small agricultural townships. From around 1725, in the aftermath of the first Jacobite Rising (known as the 'Fifteen) clansmen had begun immigrating to the Americas in increasing numbers. The Disarming Act of 1716 and the Clan Act made ineffectual attempts to subdue the Scottish Highlands, so eventually troops were sent in. Government garrisons were built or extended in the Great Glen at Fort William, Kiliwhimin (later renamed Fort Augustus) and Fort George, Inverness, as well as barracks at Ruthven, Bernera and Inversnaid, linked to the south by the Wade roads constructed for Major-General George Wade. These had the effect of limiting organizational travel and choking off news and so further isolated the clans and limited the unrest to local outbreaks. Nonetheless, things remained unsettled over the whole decade. It was only in the mid-nineteenth century that the second, more brutal phase of the Clearances began; this was well after the 1822 visit by George IV, when lowlanders set aside their previous distrust and hatred of the Highlanders and identified with them as national symbols. However, the cumulative effect was particularly devastating to the cultural landscape of Scotland in a way that did not happen in other areas of Britain. While the collapse of the clan system can be attributed to more economic factors and the repression that followed the Battle of Culloden, the widespread evictions resulting from the Clearances severely affected the viability of the Highland population and culture. To this day, the population in the Scottish Highlands is sparse and the culture is diluted, and there are many more sheep than people. What the Clearances started, however, the First World War almost completed. A huge percentage of Scots were among the vast numbers killed, and this greatly affected the remaining population of Gaelic speakers in Scotland.